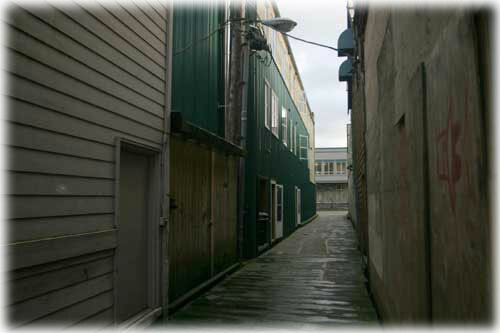 Ketchikan, Alaska - There is an alley in downtown Ketchikan named Betty King Alley. It's a very narrow little mid-block lane that begins on Dock Street and cuts through to Mission and then to Mill Street. Mill is a comparatively new (1972) street named for the sprawling and now-gone Ketchikan Spruce Mill that buzzed and rumbled with activity at the site for some eighty years. A few years back, the previously anonymous alley was finally named. The name chosen was Daly Alley, chosen to honor one of the Spruce Mills pioneer families. It was a dubious honor, actually. And at least one member of that family may not have been delighted with the tribute. So the alley was then more appropriately re-named in honor of Betty King the Dog Lady, a long-time alley resident and dog lover who was the town's one-woman volunteer humane society. Nobody ever spoke of her as just plain Betty King; she was always referred to as Betty King the Dog Lady, sort of like Alfred the Great or maybe Louis the Good. Betty was proud of her title, as she was proud of her dear dogs. They all lived together in a tiny two-story house on the alley, built by private business leaders especially for her and her canine charges. From its beginnings, Ketchikan had stray dogs, the occasional dogbite, and the ever present sidewalk dog piles. Although the City made efforts at various times to handle the pet problems, it was Betty King who served as best she could the stray dog population from the mid-1940s until her death in 1970. 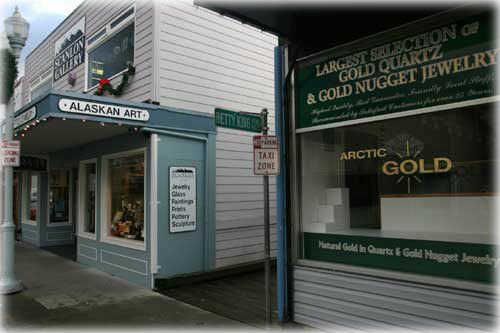 Ketchikan's Borough, the form of local government required by the Constitution of the new State of Alaska (1959), was structured gradually in Ketchikan as a series of assemblymen formulated its borough code. There was no animal control until the Gateway Borough took over that power shortly after Betty King's death. Finally, in 1982, an borough animal shelter was built south of town, near the cemetery. Betty's particular piece of property was originally the lumber storage yard behind one of the city's oldest businesses, A.C. Kreidler's (est. 1905) carpentry shop, converted about 1925 into the Union Rooms. There, in the mid-20th-century days before Ketchikan had any sort of animal control or facilities, Betty King cared for the town's strays along with some of her own purebred dogs. Little is known about Betty King's earlier life or even when she first came to Ketchikan, but her friends guessed that it was in the late 1920s or early 30s, when Betty was already in her 40s. At her death in August of 1970, at 84 years of age, Betty King's death notice listed her as Elizabeth I. Nesphus. She had married a Ketchikan man named Nesphus, who people knew only as Bergen. Betty King was born in Cleveland, Tennessee, on May 5, 1886. She saw herself as a true southern lady from the day she came to Ketchikan, and she expected to be treated with respect. She declined to talk to her chosen few friends about her years as a sporting woman, although it was common knowledge that she was involved in a long-standing feud with Dolly Arthur of Creek Street. Both women loved and raised dogs, and the friction may have started because of their pets. Betty has been described, politely, as having a "rather strong canine" odor, which was stronger in wet weather, but she always kept her going-around-town clothes hung in the fresh air in an attempt to minimize the smell. She was a petite woman with much-envied small feet - she wore a size 4 shoe! Those tiny feet gave her a great deal of grief, so she often padded around her house and splintery yard in her bare feet. She dressed as nicely as her means allowed. In her later years, she kept her white hair colored a cheerful shade of red that was really more orange. She was seen in the colder months wearing a tweed-like overcoat as she walked her dogs. Those walks were occasions to watch with amusement and with wonder at her infinite patience! The little woman might be holding four or five leashes at once as the dogs some small, some large - pranced and cavorted with joy at their go-for-a-walk freedom. As they dashed to and fro, enjoying to the fullest the sights and smells of Ketchikan's sidewalks and litter, they often wove and tangled their leashes in and around Betty's short legs. So she calmly stepped over this leash and that one, and untangled the leads until she and her charges could again walk on down the street - where the tangling was repeated and she patiently straightened it out again. Everyone knew her, but no one taunted her, not even small boys. One boy said she could look fiercer than some of her dogs when she chose. Oldtimer Earl Fosse remembered Betty as a nice looking woman, intelligent and well spoken. She was, he said, a pretty woman when she was younger. He recalled her coming into his shop one day for a stack robber for the stove in her little house in the alley. She made it plain that she didn't want him to come to her house, however, but one of his employees could go in to install her stack robber. The workman reported that it smelled very strongly of dogs! Betty paid off her obligation to Fosse at $5 a month, with a gift of a bottle of crËme de menthe at the end of her contract. The late Isobel Daigler, longtime manager of the Coliseum Theater, came down from Juneau to Ketchikan with her husband just after World War II ended in 1945 to manage the theater. Mrs. Daigler became Betty King's friend although it was a friendship with a rocky start. Mrs. Daigler, who also loved dogs, had a little fox terrier named Foxy. Betty King saw him and wanted to mate him with one her terriers. Betty lived with her husband Bergen out on North Tongass then, somewhere close to the Mecca Bar. So Mrs. Daigler took her beloved Foxy out to Betty King's house and left her dog there. But Betty failed to return him promptly and Mrs. Daigler became quite upset about it and went out in a huff and took him home. Some years later little Foxy died and she wanted to buy another dog. But she had heard on the grapevine that Betty King had given someone a dog - given it away - but she was going to charge her friend for a pup! Mrs. Daigler was then furious at Betty, who kept avoiding her and scurrying away when she caught sight of Mrs. Daigler downtown. Then one day Mrs. Daigler finally cornered Betty and gave her a piece of her mind! But Betty archly replied that she could afford to give that dog away if she wanted to because, I knew that dog would find his way right back to me anyway! Mrs. Daigler said she just shook her head but decided to be friends with Betty again. By that time - sometime in the late 1940s - Betty King's home on North Tongass had burned. Bergen chose to stay and rebuild while watching and tending some of the more rambunctious dogs. Betty chose to move to town and set up dog-keeping in the little house tucked into the alley. There are always those who snicker at eccentric people. But Ketchikan being what it is, everyone appreciated what Betty did. Downtown businessmen helped her in her new location, donating meat and other goods for her dogs and for herself. Dorothy Fosse at the Mode O Day gave Betty dresses. When the little house suffered a fire one winter, several downtown businessmen rebuilt it for her. Betty's husband Bergen died in 1960. Some years later Betty King fell ill after a minor stroke and found herself in the hospital. A fickle fate had somehow put her in a two-bed room with her old nemesis, Dolly Arthur! Being so close together, Mrs. Daigler said, the two elderly women resolved their differences and managed to become friends in the concluding years of their lives. Maybe the friction had been because both unconventional old women loved dogs more than they loved people. Betty King died alone in her little house in the alley in August of 1970, her dogs whining and baying. She was 84. Ketchikan Daily News reporter Bob Kinerk reported that word of Betty King's death reached the newspaper. Her dogs were said to be giving the people who came for her body a hard time! He grabbed his camera, thinking he'd get a comical shot of her body being carried out on a stretcher in the midst of a sea of howling dogs. What he actually got, he confessed, was his comeuppance for thinking of her as a joke. He wrote, "The first thing I thought when I got to her dwelling place was how neat and tidy it looked. The house itself was small and surrounded by a sturdy fence of two-by-fours and cattle wire. It certainly didn't look like a dog pound. It looked like someone cared about that dwelling." "The tipster's description of the trouble with the dogs was very accurate. Inside the yard a city worker with heavy boots and heavy gloves was trying to corral the animals, about a dozen of them, which were in a sort of frenzy and were probably very dangerous, he continued. With him was a woman I didn't recognize, but she looked like she had slipped into her coat and come straight from an office. She wore heels and nylons, and her hair was coiffured. Perhaps she was a social worker, or perhaps she was a friend. She was helping with the animals and appeared to be in greater danger from their excitement and fear than the more suitably dressed man." "It seemed to me," Kinerk's account continued, "that my question about the disposition of the body ought to be addressed to her, so as soon as I'd popped out of my car and reached the fence I said to her something like, 'Have they brought out the body yet?' The woman looked at me with so much venom that I wished the planks had parted and I'd plunged into the icy Narrows underneath." "I don't believe she swore at me, but she probably didn't have to. She said she didn't know what the newspaper, which never cared about Betty King when Betty King was living, meant by sending out a cameraman now that the poor woman was dead. I have a whole slew of answers to questions like that," Kinerk continued. "Most of them have to do with the public's right to know and so forth. None of them seemed appropriate among those frenzied dogs. I stood awhile looking penitent and hoping time would soften the woman's response. It didn't, however. She continued to glower. The dogs continued their leaping and barking." He got into his car and left. "The measure of my guilt in this is that whenever I saw her afterwards," he wrote, "I imagined she looked at me with hate, and the measure of my ignorance is that I never knew why I deserved it. Now, upon reflection, it seems to me quite plain. It seems her anger at me was intended to say that she was a person with a compassionate heart, and I was a person who lacked one." His story ended on a note of contrition. Betty King left the house and property to Gordon Zerbetz, the son of Jack Zerbetz, one of the businessmen who built the house for her. Gordon had the little house cleaned but no amount of cleaning would erase the doggy smell. So he had the very walls and floors removed and replaced with new construction. The little house may be gone by now? But the feral cats remain, their kittens peeking out from unexpected places in search of food. A number of cruise ship personnel discovered the cats and each year visit the alley to leave them scraps and treats. That alley just has heart. And today, all these years after Betty King's life came to an end, her biography is itself so obviously full of so many examples of compassion - within an appreciative civic and business community that freely provided her with a house and donations of many kinds; in the dog lovers who valued and trusted her, and in a citizenry that may have stared but still respected her and her dedication to the animals. That, after all, is Ketchikan. Excerpts from Bob Kinerk's story courtesy of The Ketchikan Record 1990.